It's Rhonda here today to host the blog. I have a card to share that I've used the pattern paper sentiment as part of my overall design. In honor of Mother's Day I wanted to create a card that would be suitable for Mom on her special day or serve another purpose as well. 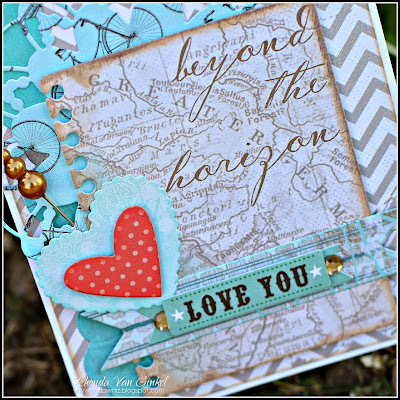 I started with the Baggage Claim 100 paper, then cut the "Beyond the Horizon" sentiment from it. I added a few hearts and doily behind it, then finished with the banner backing for the "Love You" sticker in the Sheer Joy collection. Thanks so much for stopping on over today! Have a super and special weekend!!! Rhonda this is such a beautiful card. I absolutely love the colors and the detail! Rhonda, what a beautiful card. The die cuts and combinations look gorgeous. Congratulations!